In keeping with the Urban Air Mobility initiative, NASA has signed a space air agreement with Uber to further these goals and participate in the future of urban air travel. Big plans are in the works for Uber and their UberAir program, with plans to start demonstration flights of their flying taxis in 2020. Ambitious as it seems, Uber is investing in the technology needed to make this a reality. They just announced the opening of a new research and development facility in Paris, France called the Advanced Technologies Center (ATCP). ATCP will work on artificial intelligence and airspace management systems. Uber is focusing on constructing an all-electric plane for their air taxis. One of the major hurtles is designing an electric aircraft that can perform a nearly vertical take-off and landing. Electric is beneficial for numerous reasons, the most obvious is the noise concern. Just one helicopter makes a considerable amount of noise. Imagine dozens of gas powered propellers flying overhead. Electric also makes distributed electric propulsion (DEP) technology possible. Propeller planes are a thing of the past, right? Conjuring up images of World War I era Spitfires. Like all things, our past shapes our future and we have come around again to propeller driven aircraft. With DEP, instead of one or two large propellers, aircraft can have many small propellers lining the wing of the plane, distributing the load. Using math and models that are over my head, it is theoretically possible to reduce drag and wing size in electric planes, increasing efficiency while reducing weight and power consumption. A handful of companies are jockeying to produce the first commercially viable, all-electric passenger plane. Most are small, holding two to four passengers including the pilot. Uber imagines a world where rooftops in urban centers act as mini airports, whisking commuters home to the suburbs over the plebs sitting in traffic below. Turning a two hour commute into 15 minutes. As you can imagine, all of this isn’t cheap. If and when this becomes a reality, you can bet your bottom dollar that it will take a significant amount of time for the price to drop to a reasonable level and make it viable for most long-distance commuters, many of whom live far outside the city due to the cost of living. 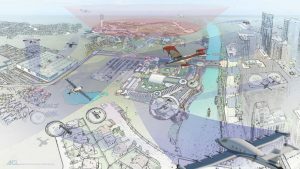 This may seem like a pipe dream, but as the only viable plan for the oft spoken of flying cars, it’s the most feasible, even if it takes a lifetime or two. This entry was posted in The Geospatial Times and tagged Out of This World, The Geospatial Times, Tips & Tech by Apollo Mapping. Bookmark the permalink.